Welcome to the November North Carolina Demos blog hop! I hope you’ve enjoyed seeing the wonderful projects the group has posted this month. You have probably just stopped by Tracie Evans Langley’s post. Isn’t she an amazing artist? Thank you so much for stopping by to see my card! I have to confess that it’s difficult for me to transition from fall to winter. Fall is definitely my favorite season with its gorgeous colors, crisp fresh air, and (of course!) Thanksgiving. This year, I have paid more attention to the colors of the leaves and tried to reflect those colors in the card below. This card would make a wonderful thank you to send to your Thanksgiving host. Yes – I am being stubborn and trying to stretch the fall season as long as possible! Lately, I’ve been trying to create projects that are a little outside my usual comfort zone, and I’m really having fun! The papers that I used for this card include the Fruit Stand cardstock pack and matching Fruit Stand designer series paper. When you first see these papers, they make you think of summer. 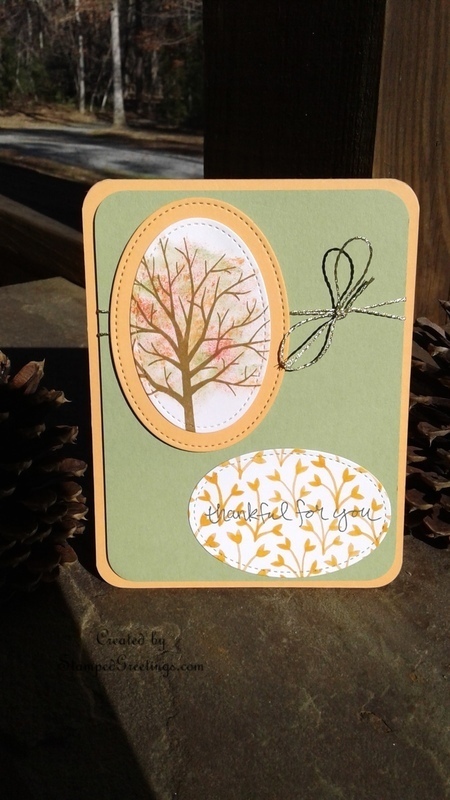 But, you can easily create a fall themed card with the papers and the Sheltering Tree stamp set. Start with a piece of Whisper White cardstock and use Chocolate Chip ink to stamp the tree from the Sheltering Tree stamp set. Then, add color to the tree. The technique that I used to add the leaf colors is stippling. Take a small sized paint brush, and tap the tip of the brush on to an ink pad. Then, randomly use the inked brush tip to add color to the tree. Tap the tip of the brush on to the branches of the tree to add color. Test your colors on a scrap piece of paper before you add the ink to your card. You can vary the intensity of the color as you complete your tree. The colors I used are Pear Pizzazz, Peekaboo Peach, and Watermelon Wonder – the colors in the Fruit Stand cardstock pack! Below is a picture that highlights the stippling technique. The incredibly popular Stitched Shapes framelits are one of the main features of this card. I absolutely love these framelits and hope you were able to get the set. If not, no worries, since they will be available in the new annual catalog. They are worth the wait! In the meantime, you can use the Layering Ovals framelits to create a very nice finish to your card. They are also incredibly versatile. I used Memento Black ink to add the sentiment to the Fruit Stand designer series paper and then cut out the sentiment with the oval Stictched Shapes framelit. I wanted a darker color for the letters since there is a fairly intense pattern on the designer series paper. The gold twine from the Baker’s Twine Trio Pack in the Holiday catalog adds the perfect finishing touch. I have used the gold twine on several projects. It is very easy to use to tie bows. I love it! 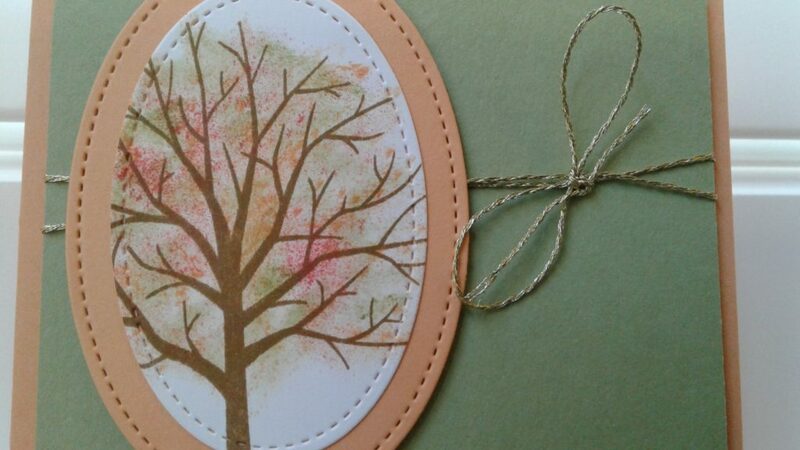 Since I used the oval framelits for the tree and sentiment, I decided to add rounded corners to the card. I liked carrying the rounded theme throughout the design. Below is one more picture of the card. This was taken indoors and shows off the colors a little more than the picture taken outside. Enjoy! I hope you CASE this card or use the idea to make your own design. I would love to see what you come up with! The products I used in the card are shown below. Click on any picture, and you’ll go to my online store. 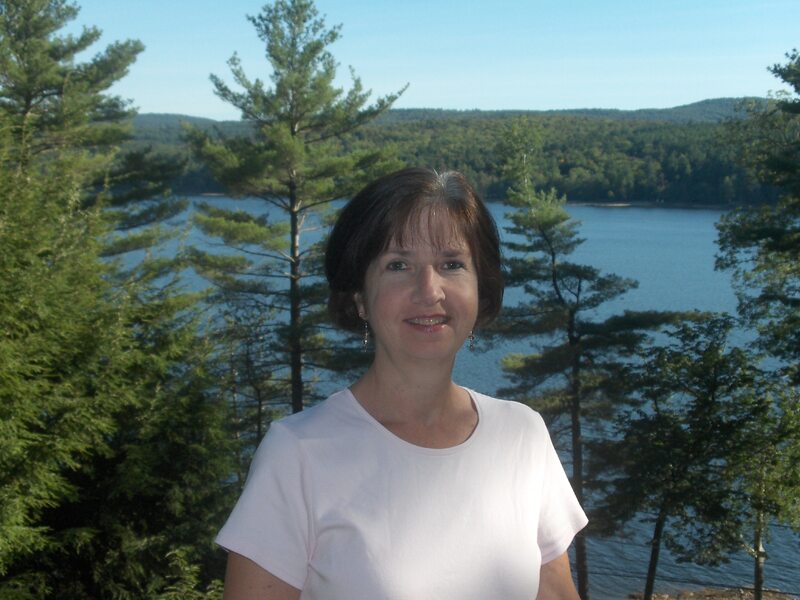 If you’re continuing on the blog hop, your next stop is Sue Root’s page. All participants in this month’s blog hop are shown below. Love that I have the Stitched Framelits! Your card is beautiful! Those Stitched Edge Framelits look great! So glad I got a set. I love how you did the tree. I wouldn’t have thought of those colors for a fall tree, but they are lovely. Love the colors on the tree and your technique showcases them well. TFS. Thanks, Susan! It was fun to experiment with the color combination to see how the “leaves” would look. I think the colors work well together. Thanks so much for your comments. Pretty card, the Stitched Edge framelits look perfect for this card. Love how you rounded the edges too. Thanks, Frances! I like the rounded edges as well. I think they add a very soft touch. Hope you had a wonderful Thanksgiving.